Rust-Oleum, a leading manufacturer of specialty paints and coatings has launched two new products. One is designed to prepare concrete block surfaces for topcoating and the other for coating overhead industrial surfaces without risk from overspray. 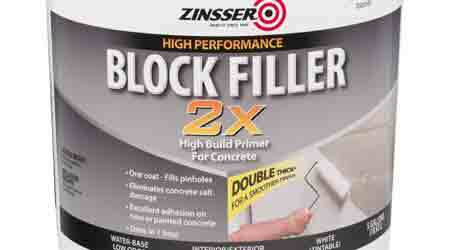 Zinsser Block Filler 2X is a thick water-base primer specifically formulated for concrete surfaces. It is two times thicker than typical primers providing superior fill for an even and more uniform topcoat. The product has superior resistance against concrete salts (efflorescence), as well as high alkalinity from newly cured concrete, both of which can be damaging to topcoat finishes. It’s perfect for the professional painter and DIYers too. Zinsser Dryfall is a commercial, water-base coating for industrial ceilings and overhead walls that is applied with the use of an airless sprayer. The main benefit of this coating is that overspray generated as a result of spraying the product dries within 10 feet of application falling dust-like to the floor. The overspray dries to a fine powder that can be easily swept away, avoiding harm to floor finishes and any equipment on the floor.